On Saturday 29th March 2014, John performed the Bruch Violin Concerto with Juliette Roos (BBC Young Musician of the Year, String Finalist 2012). This was the second time they have collaborated, the first being last March with the City of Southampton Orchestra. 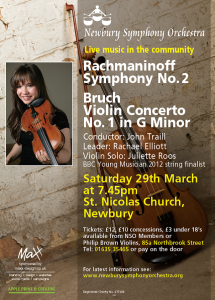 The programme also featured Rachmaninov’s Second Symphony, and was attended well – the event was also the result of an outreach parnership between the Newbury Symphony Orchestra and Berkshire Maestros, bringing local players and students together.